Docs Say Kids With Concussions Don't Have To Stay In The Dark For Days : Shots - Health News No longer do kids with concussions need to sit in dark rooms for days on end. For the first time in nearly a decade, the nation's pediatricians have loosened their guidance on concussion recovery. While a day or two of complete rest may be necessary for kids after a concussion, any more could leave them feeling isolated and anxious, says Angela Lumba-Brown, a pediatric emergency medicine physician who helped shape new guidelines. 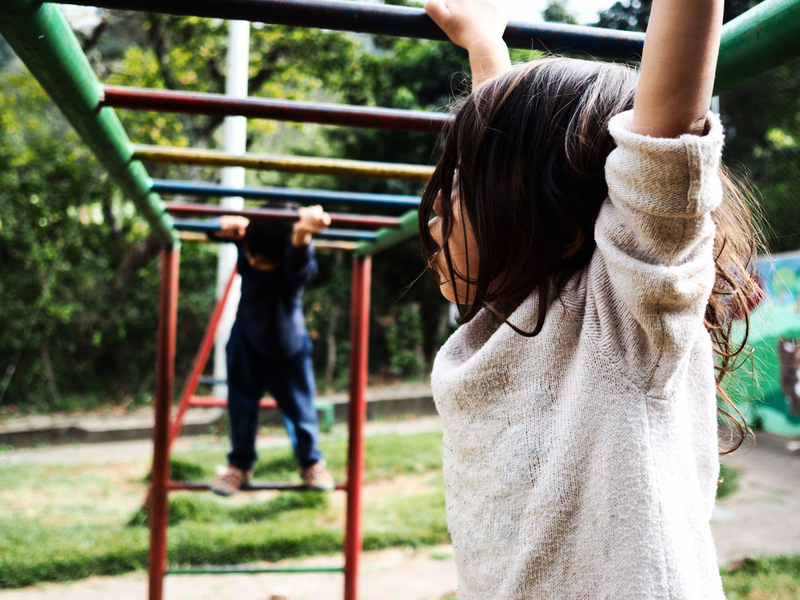 A couple of weeks ago, eight-year-old Liam Ramsay-Leavitt of Martinez, Calif., was swinging on the monkey bars at school. "And then I just fell on my side," he says. "I was kind of dizzy and I had an achy head." The doctor said he had to miss school for a week — there'd be no homework (he didn't mind that too much) but also no reading, no recess, no video games, no chess club, no activity. "I would just say it's really boring," Ramsay-Leavitt says. "And disappointing." "It was hard," attests his mom, Michelle Ramsay-Leavitt. "Especially with his energy level. After about three days, I did end up asking the doctor if he could go to school and just kind of sit." "That's because for a child, particularly, who is all about curiosity and new experiences, who has so much more energy than their mom or dad, it's almost like a punishment to tell them they have to stay in a dark room," says Dr. Angela Lumba-Brown, a pediatric emergency medicine physician and co-director of Stanford University's Concussion and Brain Performance Center. The AAP recommendations, as well as guidelines from the Centers for Disease Control and Prevention released in September that Lumba-Brown and her team developed, do suggest that kids' return to activity should be personalized — balancing their need for stimulation with their need for rest. "Physicians, parents and teachers should all work together with the child to figure out a plan," says Lumba-Brown. "Maybe after two or three days of rest, that means returning to school, but maybe just for a half day at first. Or maybe not, maybe the patient can make it through a whole day without her headache getting worse." "We're not recommending that a kid go right back out into the sports field for practices," explains Dr. Mark Halstead, a pediatrician and assistant professor at the Washington University School of Medicine in St. Louis, Mo. who co-authored both the AAP and CDC guidelines. "But they could maybe do some brisk walking or some light work on an exercise bike — things to get their heart rate going." Aside from resuming physical activity, another big change in the guidelines suggests allowing kids to get back on their phones and computers sooner. "One thing we have to acknowledge with kids nowadays is that they are highly connected socially through their electronic devices," Halstead says. In any case, there's no research to indicate that looking at screens is inherently harmful after a concussion — though in some cases staring at the TV or computer could make post-concussion headaches worse. For diagnosing concussions and tracking recovery, the older guidelines and the new ones both advise against using CT scans or fMRIs, except in severe cases where doctors suspect hemorrhaging or a skull fracture. That's because concussions rarely show up on these brain imaging tests. The two organizations do slightly deviate in their use of terminology. The AAP addresses "sports-related concussions" while the CDC guide focuses on "mild traumatic brain injuries" or mTBIs. To most people, the two terms are interchangeable — though technically mTBIs are a subset of concussions, which can describe more severe cases of head trauma. "We try to use the term 'mild traumatic brain injury' mostly because people tend to take it more seriously," Lumba-Brown says. Indeed, there's research suggesting that people tend underestimate "concussions" compared to "brain injuries." But whatever you call it, it has become clear in recent years that "this sort of injury is more common than we previously thought," Lumba-Brown says. An estimated 1.1 million to 1.9 million children are treated for sports or play-related head injuries in the U.S. each year, though researchers think that many more cases go unreported. "The difficulty is, not every kid with a concussion is going to get up and start stumbling," says Halstead. "You can't always see the symptoms, like headache or dizziness." Older kids, especially those who are serious about their sports, may not tell adults that they're feeling off. "They may be more concerned about getting to the game, or not disappointing their teammates," he says. That's why adults need to be vigilant — ask kids specifically how they're feeling, and notice when they're acting odd. At the same time, sports and play are an important part of childhood, he says. "So we don't want to put kids in a bubble, either, just because we're afraid."